Stamco Industries has a wide range of coil-fed presses which are capable of producing complicated stamped metal components off of progressive tooling. 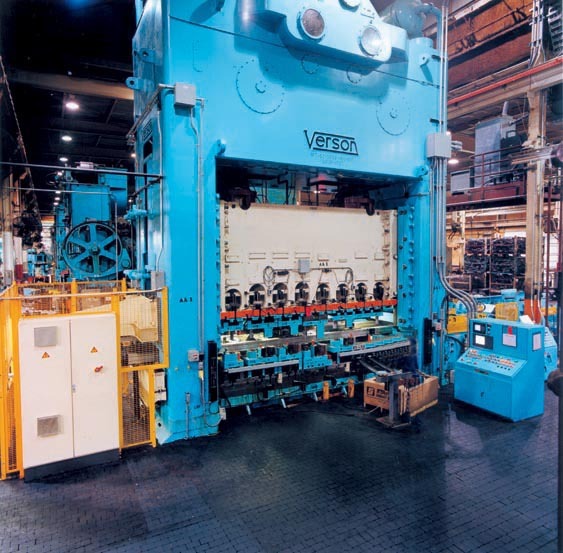 From our 350 ton high-speed “Heavy Stampers” up to our 3,000 ton press, we can handle almost any sized set of tooling. Our 264” long extended bed press allows us to run complex progressive dies that require a long feed length, or multiple progressions. Current coil feed equipment can handle materials up to .500” thick and 50” wide. Our unique Transfer Presses allow us to be able to produce many parts that other stamping companies cannot. Current equipment utilizing transfer capabilities range from 800 tons up to 3,000 tons, with press-bed lengths that range from 120” up to 264”. This allows Stamco to mount more tools in one press, eliminating the need for additional operations, and keeping costs to a minimum. Stamco Industries was founded over 30 years ago, producing medium to heavy-gage components off of single-hit tooling, and this is still a major company focus today. With over 40 presses dedicated to producing this style of parts, Stamco has the ability to stamp a wide range of components. Stamco’s single-hit presses have tonnage capacities that range from 30 tons up to 1,500 tons, with most of the sizes being duplicated for manufacturing flexibility. Single-hit technology is excellent for those programs that do not have the volumes to justify the expenses of transfer tooling, or for existing programs that have gone to “Service” volumes. Process flexibility is the key in producing competitively priced stampings, and Stamco Industries is a leader in this field.